I've been scheduled to attend Brooklyn's "Kindiefest" for a few months and my excitement has been growing. Since I was going to be in town for a few days prior to the family music convention, I decided to book a recording session to record some jazz band and horn arrangements for some of the new songs. 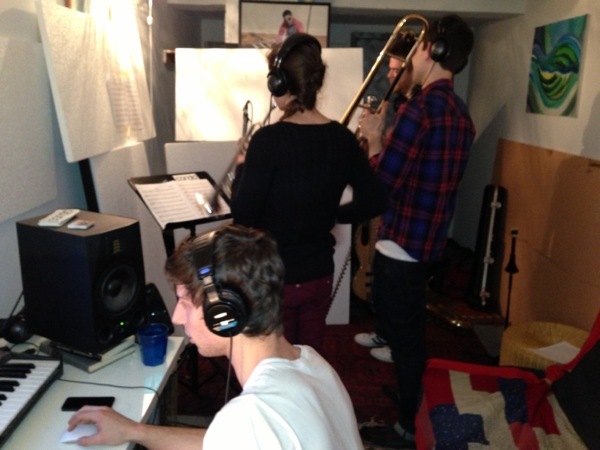 Last night, we recorded in Williamsburg (Brooklyn) and had a great session! It's so fantastic to hear young musicians that are so good at their instruments. I can't wait to get back to my studio and drop the new parts into the VARIETY demos. The latest demo from my "Variety" recording sessions is a song I've been working on for several years. I wanted to create a song about being afraid of the dark, but then somehow overcome the fear during the song. The second verse is meant to be empowering.